Wednesday 2-4 p.m.; Friday 2-3:30 p.m.
Elena Russo holds a Licence ès Lettres from the Université de Genève and a PhD from Princeton University. Her interests focus on seventeenth- and eighteenth-century French literature, cultural and intellectual history of the Enlightenment, sociability, the history of aesthetics and criticism. 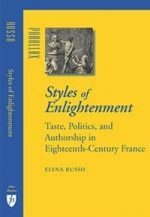 Her books include Skeptical Selves: Empiricism and Modernity in the French Novel (1996); La Cour et la ville de la littérature classique aux Lumières (2002) and Styles of Enlightenment: Taste, Politics and Authorship in Eighteenth-Century France (2007). She is also interested in the seventeenth-century libertines and religious dissidence and has written on Giulio Cesare Vanini and Pierre Bayle. Her current project examines the ways in which authors see time as shaping and inflecting the reception and the value of their works. 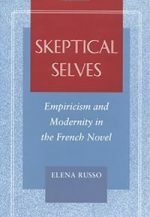 Elena Russo's books include Skeptical Selves: Empiricism and Modernity in the French Novel (1996); La Cour et la ville de la littérature classique aux Lumières (2002) and Styles of Enlightenment: Taste, Politics and Authorship in Eighteenth-Century France (2007). Her current book project examines the ways in which authors see time as shaping and inflecting the reception and the value of their works. The general argument is that there is a strong relationship between models of transmission of aesthetic value and models of cultural, theological and biological "evolution." Among the authors featured in the book are: Denis Diderot, Voltaire, Charles Bonnet, Jean Le Rond d’Alembert, Pierre-Simon Ballanche. “The Youth of Moral Life: the Virtue of the Ancients from Montesquieu to Nietzsche,” Montesquieu and the Spirit of Modernity, Studies on Voltaire and the Eighteenth Century, 2002: 09, 101-23.